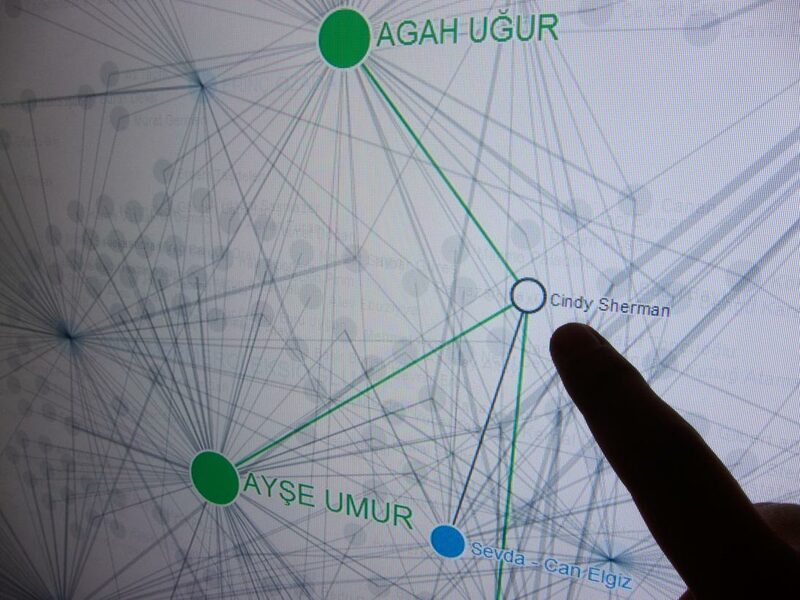 Artist Collector Network: Phase III is the third phase of an ongoing data collecting and mapping work that will be exhibited in the Datascape exhibition at Borusan Contemporary in Istanbul, 26 April – 1 September 2013. 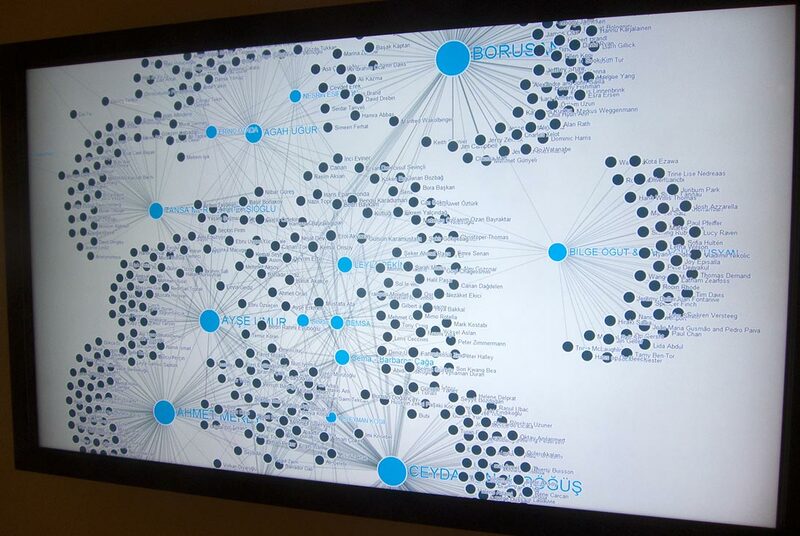 It is an exploratory network map of collectors and artists based on the relationship of being in an art collection. With the third phase of this work, I introduce an algorithmic prediction system, which presents future links between artists and collectors. That is the probability of a collector acquiring a work from a new artist and vice versa. With this phase artists as well are invited to participate with a list of their collectors, so the map includes data from both parties of an art work acquisition. Finally, the interactive map and its data are being prepared to be publicly accessible online. Artists: Burak Arıkan, Angela Bulloch, David Claerbout, Ryoji Ikeda, Michael Najjar, Enrique Radigales, Thomas Ruff, Karin Sander, Charles Sandison and Pablo Valbuena. Artist Collector Network Phase III view from touchscreen installation. Artist Collector Network Phase III closeup view showing a collector’s artists and prediction of future acquisitions in green. Artist Collector Network Phase III closeup view showing artist Cindy Sherman’s collectors and prediction of future acquisitions in green. Artist Collector Network Phase III closeup view showing artist Kutlug Ataman’s collectors and prediction of future acquisitions in green. Artist Collector Network: Phase III is the third phase of an ongoing data collecting and mapping research project on the “nature” of the society of art. In the process of generating the data, each collector in the map was asked to convey a list of artists in their art collection. These lists of shared artists connect the collectors on the diagram, which organizes itself by running as a software simulation. 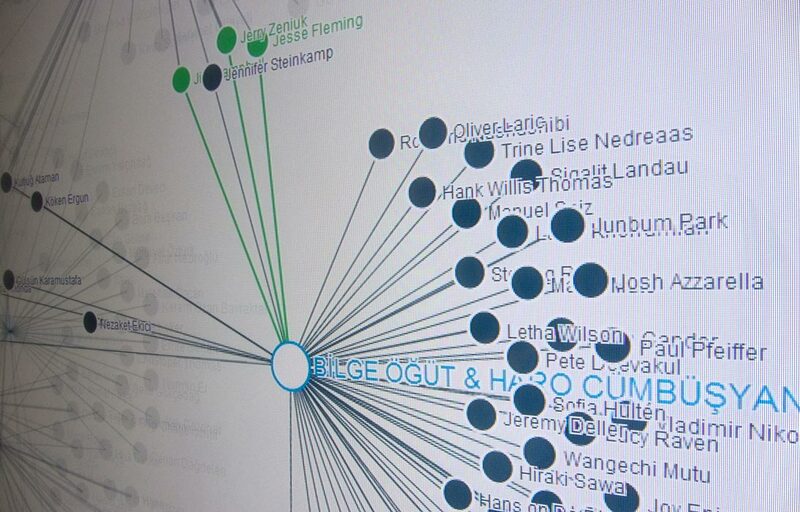 The names naturally find their position on the screen through connecting forces, revealing the central actors, outliers, indirect links, and tight clusters. Despite assumed, a map is not a mere representation or just a visualisation of data. As its definition clarifies, map as a container of data is a tool to read the topological depiction and make use of relationality at scale. With this work, the network map is an algorithmic interface, which is run by computational analysis or in other words by software. Therefore one can explore the network diagram by highlighting certain parts while filtering out others, analyze and understand the network structure and see what are the central actors, which of them are in the periphery, which actors have indirect relations, where the organic clusters are formed and where gaps between certain clusters exist, thus you explore invisible power relationships. Even in cases where big amount of data dictates a larger map than a visible plane, algorithmic interface provides access to its use. 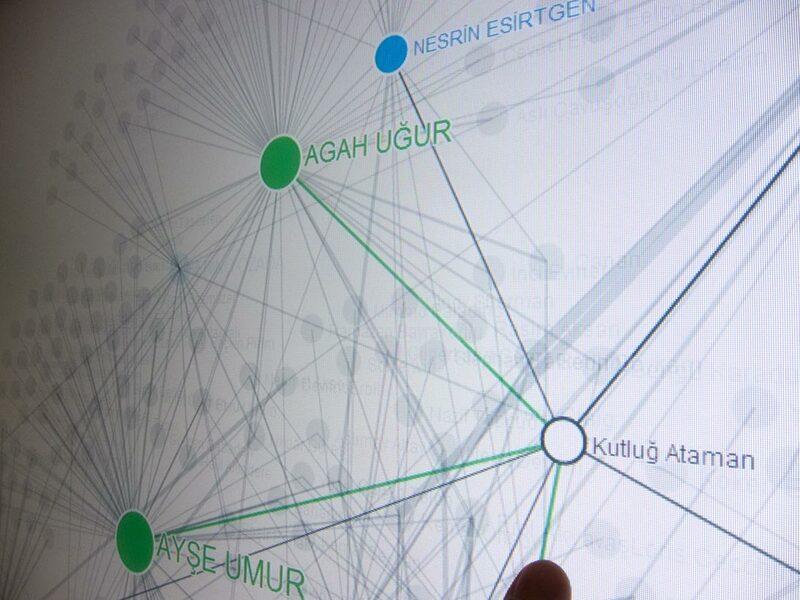 Therefore, a network map has less to do with a visual language than an algorithmic language. In other words, a network map provides a more complete picture of the network than what each actor knows naturally, yet partially about the nature of the network structure. A subject be it an art dealer, collector, advisor, or an artist, may be knowledgeable about some of the relations existent within the network they are a part of, but a map with a multiplicity of data sources has the advantage of revealing a bigger picture of reality. With the third phase of Artist Collector Network Arıkan introduces an algorithmic prediction system, which presents future links between artists and collectors. That is the probability of a collector acquiring a work from a new artist and vice versa. Tapping a name on the map highlights its direct connections and also the predictions in green color. Link prediction is another algorithmic use of a network diagram, where the data structure and its use reveals new information about power. The first phase of Artist Collector Network is a part of the permanent collection of the Borusan Contemporary Museum in Perili Köşk. The second phase of the project included collectors and artists was affiliated with Maçka Art Gallery. The third phase of the project will be shown in Datascape Exhibition once again in the Borusan Contemporary Museum in Perili Köşk.